Discussion in 'United States at Sea!' started by GJPBoston, Nov 18, 2018. 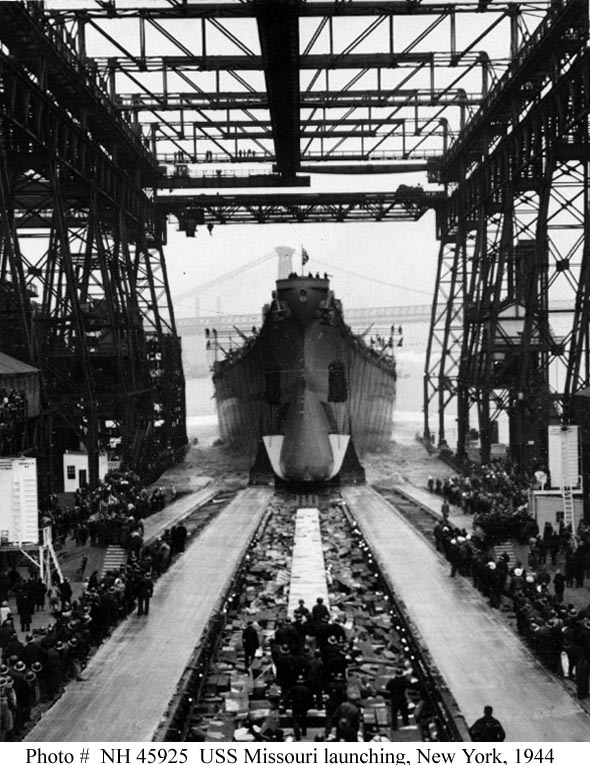 I understand that dry docks (or graving docks) were used for both construction and maintenance of larger ships, but what was the the size cutoff when a drydock would be used to construct a new warship versus manufacturing it in a yard and launching it on a slipway? My impressions is that by WW2 all new battleships needed to be manufactured in a graving dock, but what about cruisers and destroyers? I have seen references to a particular dry dock being able to fit multiple destroyers, so I know dry docks were used with destroyers, but was that only for maintenance of new construction too? Same question for repairs--I assume destroyers and larger needed a drydock for repairs, but what about sloops, Destroyer Escorts, etc.? New Jersey and Missouri were both constructed on always so not on the battleships. IIRC, Portsmouth constructed 3 Gatos in one drydock, but I have to double check that. Mostly, dry docks were necessary for periodic scraping the hulls clean, as a fouled hull could cost a few knots off a ship's top speed. Also to construction most yards specialized in construction of only a few types. USMCPrice and GJPBoston like this. Takao, thank you, I am not sure I understood your first sentence: Were you saying both NJ and Missouri were constructed in drydocks, but that not all battleships were constructed in drydocks? Re: multiple ships in a drydock, I have seen reference to a French drydock large enough to hold one French battleship, instead being used to hold 2 destroyers and 2 cruisers. Here are some images of destroyers being built in drydocks in the Charlestown Navy Yard (Boston) in 1938. But I know I have seen much larger commercial ships than a destroyer being launched via a slipway, so I wonder where the size cut off was. Per the below quote from the Department of the Navy's Building the Navy's Bases in World War II, it looks like drydocks were used for Battleships (and I have seen similar references re: France's battleship building program) but still not clear what percentage of destroyers/cruisers were originally constructed in drydocks as opposed to using slipways. "By dint of major reconstruction, involving extensions and strengthening of the groundways and overhead crane structures, it was possible to build the new battleships of the North Carolina and Iowa classes, assigned to the East Coast shipbuilding navy yards, on existing inclined shipways. Many unprecedented problems were faced and solved on these projects. The Iowa class had a nominal displacement of 45,000 tons, based on London Treaty standards, and an actual displacement of more than 55,000 tons. To permit safe launching of these vessels, with a launching weight of more than 32,000 tons, it was necessary to provide quadruple launching ways, 6,000-ton triggers, and substructures at the pivoting points capable of supporting 18,000 tons instantaneous pivoting pressure. These were the heaviest ships ever launched from inclined ways. The new expansion program included five battleships of the Montana class, with a London Treaty displacement of nearly 70,000 tons. These ships, whose dimensions were predicated on the availability of the third set of Panama Canal locks, had a beam greater than the clear space between the crane supports of the existing shipways. It was necessary to provide either new shipways or shipbuilding drydocks. The latter were selected; first, to avoid the problems and hazards involved in launching ships of such unprecedented size, and, second, to gain the advantages in ease of access, facility of construction, and simplification of weight-handling operations inherent in the use of drydocks. Construction was begun on the first two superdocks, at Norfolk and Philadelphia, in June 1940." Sorry, I was at work on my cell, thanks to the spell checker, my response was convoluted. The New Jersey and the Missouri were both constructed on slipways(not in dry docks). Upon returning home and checking sources - All of the "new" American battleships(NorthCarolina, South Dakotas, and Iowas) were constructed on slipways(not in drydocks). With regards to the construction of three submarines at Portsmouth, that was correct. In an effort to increase construction numbers, Portsmouth constructed three submarines in there Drydock #1(normally, it was two). These three submarines were Redfish(SS-395), Ronquil(SS-396). and Razorback(SS-394). However, it was found that constructing three submarines at once in one drydock was too cramped, so after these three were launched, Portsmouth reverted to only constructing two submarines in the drydock. 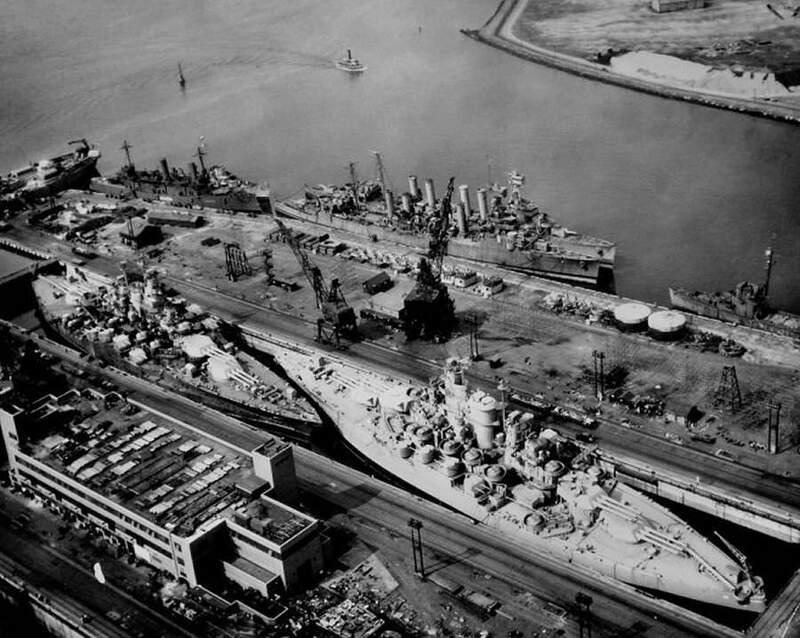 Or better yet - two battleships in one drydock - USS Tennessee & USS California in the Philadelphia Navy Yard in 1946. Carronade and GJPBoston like this. With regards to the USS Montana...It should be remembered that the Japanese launched the superbattleship Musashi, of similar weight and dimensions to the USS Montana, from a slipway. Although her sister ship Yamato was constructed in a drydock. Battleship Missouri going down the slipway. Thank you, this is very helpful. I incorrectly thought Drydocks were a bottleneck on new large ship construction, but as you point out it looks like slipways played a bigger part than drydocks for the U.S. Looking again at the book French Battleships 1922-1956, while it seems most of the French battleships were built in drydocks, slipways were used too (including Penhoet No. 1 Slipway in St. Nazaire). 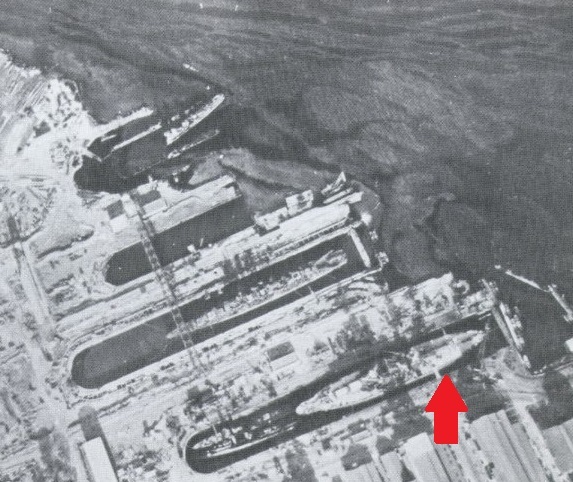 So when trying to understand a country's warship building capacity in WW2, and what bottleneck exists due to building facilities, it seems like one needs to look at both slipways and graving docks of large enough size in aggregate--is that correct/do you agree? My impression is the battleships and carriers launched from slipways were in fact built in the slipway itself and then launched--is that correct? Do you know whether smaller ships, such as Destroyers, that were launched from slipways were also built in the slipway, or somehow transported to the slipway when it came time to launch? My understanding is that an advantage of Liberty Ships was that they were built in sections elsewhere and assembled at the shipyard (at the slipway? ), meaning they did not tie up the slipways for the whole period of their construction. I am wondering if construction of smaller fleet warships like destroyers or similar sized merchant ship also did not tie up the slipways until it was time to launch? The Bismarck was built on a slipway, footage of the launch is included at the beginning of "Sink the Bismarck". Drydocks are more complex to build than slipways. This picture shows mass construction of Liberty ships. Inside each set of scaffolding is one ship. No deep trench that has to be lined with concrete and no pumps or doors. The Greeks built triremes this way. Note also two Omaha class cruisers, soon to be scrapped. Also worth noting, just behind the Omahas, is the USS Olympia(ex C-6), the dark colored ship, of Spanish-American War fame. Important dry docks around the globe are in danger of being destroyed by climate change and flooding. The yard at Norfolk is in trouble but the Navy has gotten little sympathy from the President or Congress. I'm in the Philadelphia area myself, visited the Olympia many times. For the US. graving docks were much less of a factor than slipways. Simply put, graving docks were needed, not just for routine maintenance, but also to repair a steady stream of damaged vessels returning from the Atlantic and Pacific. More than likely, this would go for most other major naval powers. Bottlenecks could be many...Maintaining a steady supply of steel and armor, propulsion always needed a long lead time, the yards needed to maintain enough workers to work 24/7(the yards needed not just skilled workers but also "white collar" workers such as managers, engineers, naval architects, supervisors, & foremen), prefabrication helped to speed the construction process(however, it could also make things more difficult when prefabs didn't match up - The German Type XXIs were notorious for this). Then there is the fitting out process after launch - IIRC, the US lacked a steady supply of 40mm Bofors and 5-inch/38s early in the war, and this lead to hold ups. The Japanese also ran into similar problems - like having older guns with a newer fire control systems or newer guns with old fire control systems. It also took the Japanese a few years to replace their older heavy AA guns with more modern ones. AFAIK, all ships were built on the slipways. The only variance to this, that I know of was Slipway D at Manitowac Shipyards which used a side-lauch system, and way D was large enough to accommodate one submarine that was being readied for launch and one that was just beggining construction. However, there were only two occasions where this was done. That being said...Prefabrication of parts, but not necessarily sections, was relied on to speed construction of ships of all types, and shipyards had separate storage areas for these parts. My understanding is that an advantage of Liberty Ships was that they were built in sections elsewhere and assembled at the shipyard (at the slipway? ), meaning they did not tie up the slipways for the whole period of their construction.I am wondering if construction of smaller fleet warships like destroyers or similar sized merchant ship also did not tie up the slipways until it was time to launch? For the most part, the prefabricated sections were built at the shipyard, and would then be moved to the slipway and welded in place on the ship. Prefabricated work amounted to about 61% of a Liberty ship. 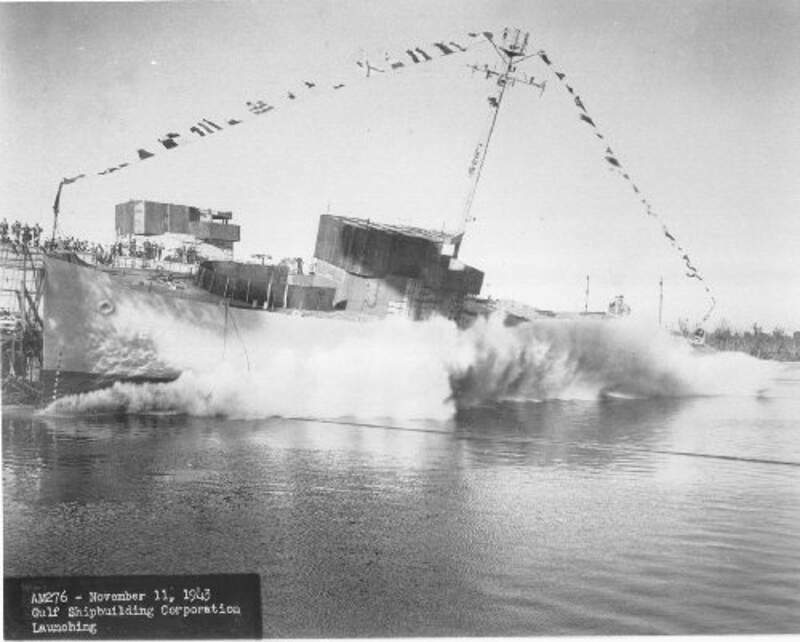 The record-holder was the Liberty Ship "Robert E. Perry" which, on November 12, 1942, had gone from keel-laying to launching in 4 days 15 hours and 26 minutes. Further, Liberty ships were launched essentially complete, whereas, warships would then be moved to a "fitting out" dock/pier and take some months to complete. So, in essence, warships did not tie up slipways for their whole period of "complete" construction either. That being said, the "Robert E. Perry" was an outlier, and the shipbuilding process was an evolutionary one, with the average time of completion going from a high of 239.8 days in January, 1942 to a low of 61.8 days in February thru June, 1945. Dravo Shipyard on the Christina River in Wilmington, Delaware was another that used side launching, for LSTs and DEs, both slightly over 300' in length. I am not sure about the Japanese but one of the things I think I remember from Wages of Destruction is that German industry never went to 24/7 or even 24 hours a day for the most part. It would be interesting to know how wide spread the practice was by various combatants. Probably best in it's own thread though. Good thread. A lot of interesting info!